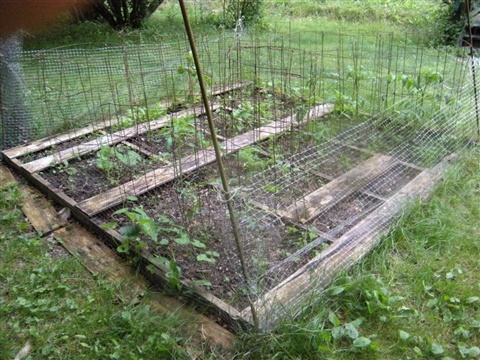 Raised Bed gardening - Raised beds are generally made of wood, but plastic can be used. It is recommended that the wood not be treated. A box is built to the size required, good top soil added (be sure it isn't pine) with some good organic fertilizer and the planting can begin. You can put these in many areas, including places where the soil is not very good. If you have trouble from moles and voles, you can put some hardware cloth down first, setting the box on top or securing it to the box bottom. There are many videos on how to build easy raised bed boxes. Hey, check out my raised-bed pallet garden in the photo below. Raised Row gardening - If you have nice rich soil, you can hoe the soil into a row mounding it about 10-12 inches high. Make the row as long and wide as you like. They hold up for one planting season and you don't need a raised-bed box to go around it. Just flatten to top a bit with the back of a short-toothed rake before planting. Backtoedenfilm.com gardening - Super easy garden with no plowing, tilling or weeding (well, almost none). You need newspaper, water to wet the paper and mulch. Be sure to watch the video. One bit of warning--be sure to keep the paper and mulch back from the starter plant by a few inches. You don't want to smother the new growth or encourage insects to hide under the mulch or paper. I had this problem with an overabundance of slugs. 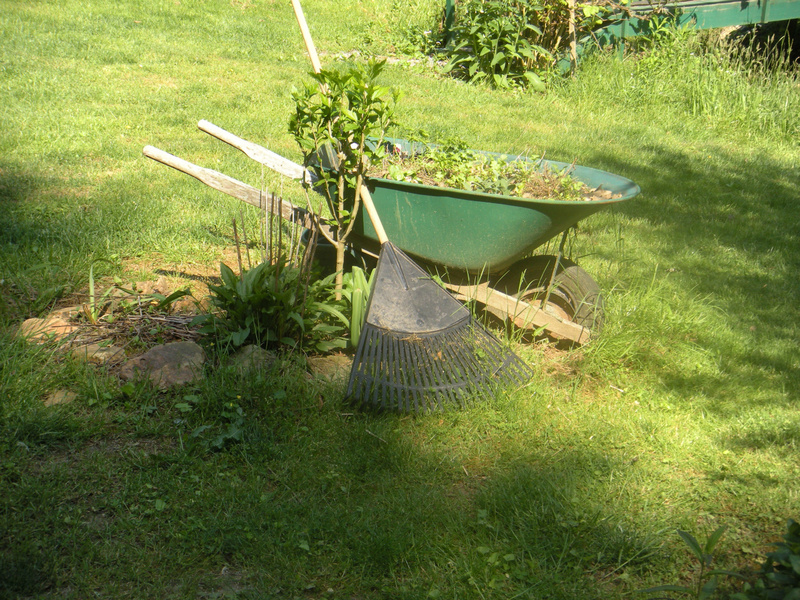 Plow and Till gardening - This is the old-fashioned garden method that many people still use. First, you plow the area and leave it sit for a couple of weeks, then harrow it to smooth out the top. This can be done right after plowing. I usually use my Husqvarna tiller to smooth it out even more before planting the rows. 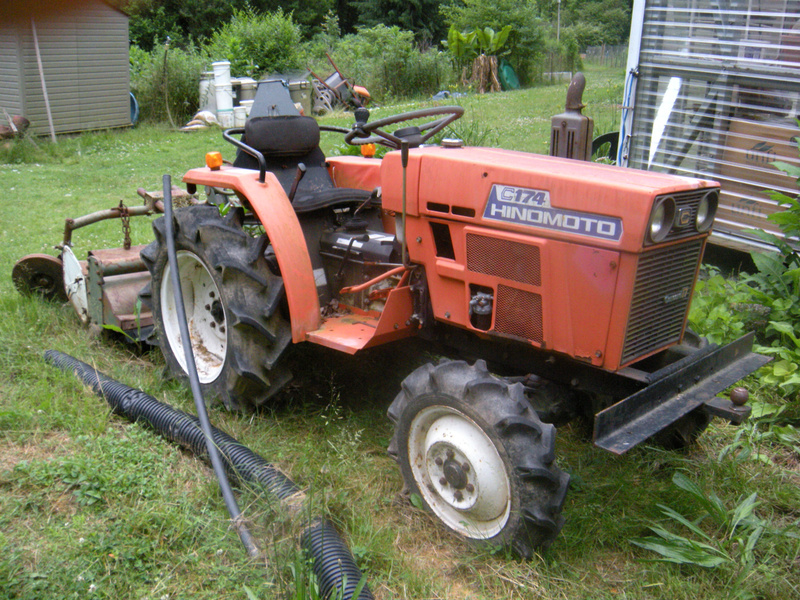 Be sure to leave enough room for a tiller to go down each row or you will be ho-ho-hoeing up weeds a lot. You can also cover the walk paths with old carpet or cardboard. Container gardening - You can grow plants in just about anything, even an old boot. You need good soil, organic fertilizer, good drainage and a plant(s) that will work for the size of the container. Container gardening is especially helpful for those who do not have much land, live in a condo or apartment, etc. These are the types of gardening I have done. 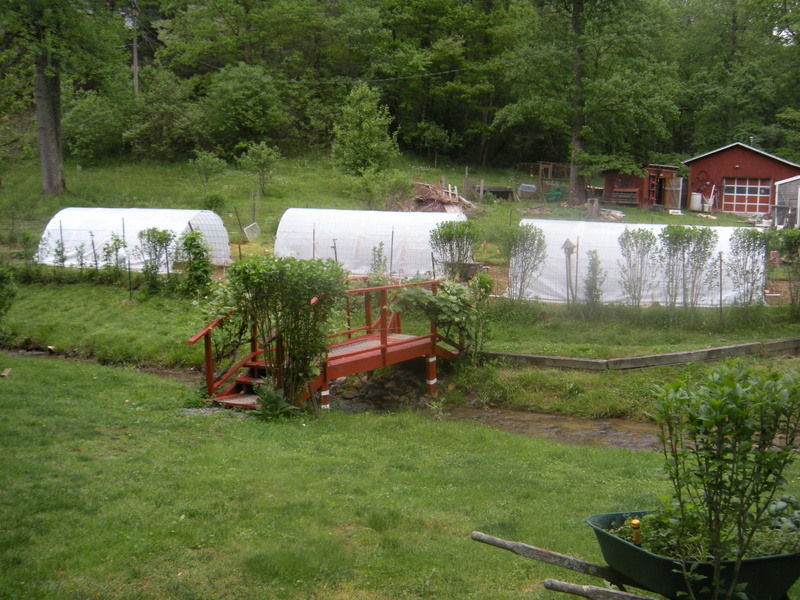 Each one had their pluses and minuses, but they all grew yummy veggies. 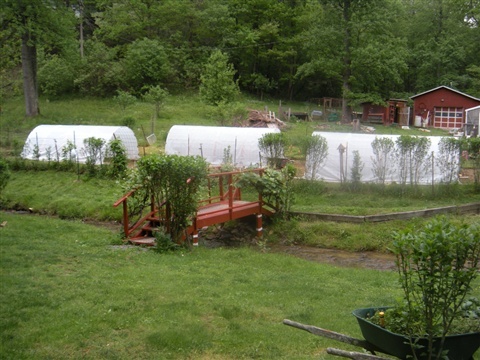 My favorites: Hoop House and Backtoedenfilm.com Hoop House gardening can be used year-round. 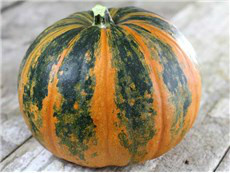 Buy non-GMO, organic seeds only - Open-pollinated and heirloom are best. Learn how to save seeds - There are many books and DIY videos on this subject. The internet also has many places to find specific how-tos for your needs. How to know if seeds are viable - wet a paper towel, sprinkle on a few seeds, roll it up and place in a plastic zip-type bag. 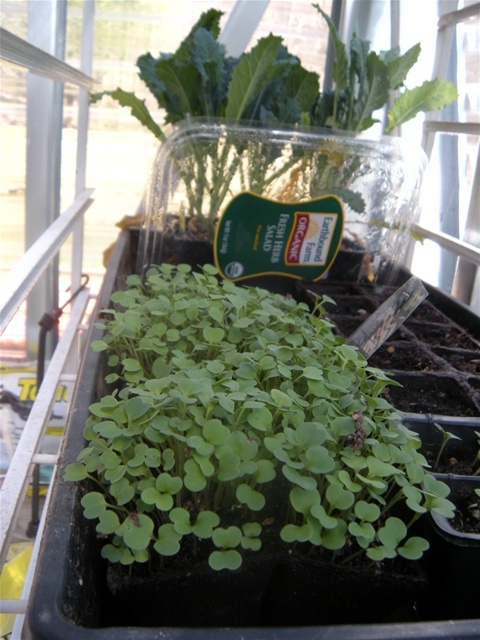 Depending on the germination time, e.g. 5 or 10 days, you can open the bag and see if the seeds germinated. If yes, then plant them in little pots. Starter plants vs. planting seeds directly in the ground - Personally, I like using starter plants that I grow myself in little pots from seed. Sometimes, I buy starter plants at nurseries and local stores, but the same thing applies as with seeds--buy organic, non-GMO and open-pollinated. The only seeds I plant directly in the ground are peas and beans. When I plant lettuce or greens in the ground, I have to be diligent to watch the tiny plants. Flea beetles just love them. Trellises, cages, poles and staples - Climbing plants like cucumbers and beans or tall plants like tomatoes and peppers need help. I have decided the best way to handle climbers is fencing. I drive a T-post or rebar rod into the ground in a couple of places and tie on a sturdy piece of fence or cattle panel. 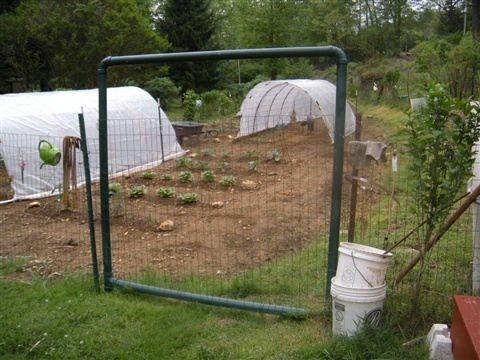 I like this method because it is easy to remove the plants and fencing at the end of the season. Also, I make cages out of fencing (2" x 4" x 6 ft) for tomatoes and cut these in half to 3 ft. for peppers. These can be stablized with rebar poles. Rebar is available at most hardware or lumber supply stores. Another handy item is 12-gauge wire staples. You can make them yourself. Just cut the length needed and bend the wire in half. These staples can be used to hold down cages, floating row cover, weed cover and more. Seed saving - There are so many books on saving seeds that I can't list them all. I recommend checking out book sellers online. A really good place for used books is www.thriftbooks.com Their prices are low, shipping is $1.00 or free. 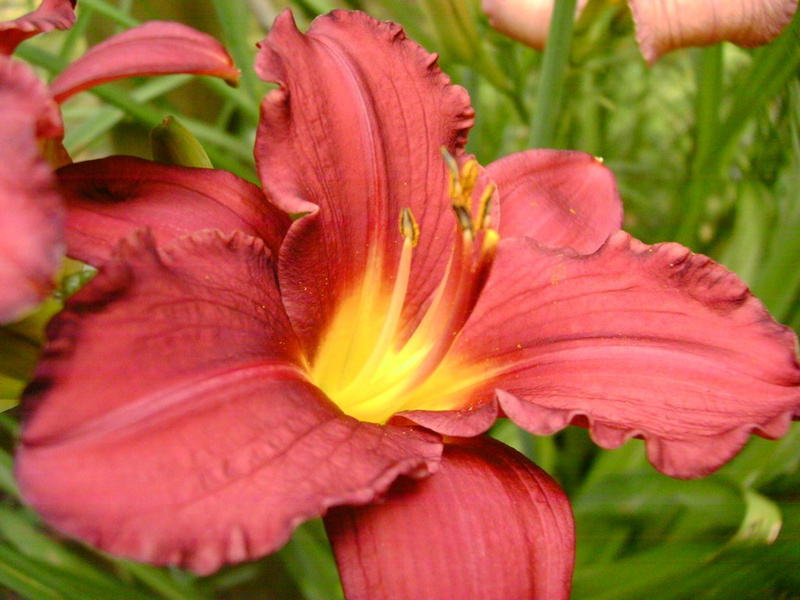 I highly recommend DIY online videos for specific gardening tasks and super ideas. Commercial fertilizers are generally chemical based. I recommend using a good quality organic fertilizer (be sure to read the ingredients) or making it yourself. Making compost, especially if you have farm animals is easy. Goat and rabbit pooplets is the best. You can purchase fish emulsion online from www.brownsfishfertilizer.com in Andrews, NC. There are seaweed fertilizers, but you will need to know where the seaweed was harvested. All Pacific and Gulf of Mexico waters are contaminated. Pesticides are deadly and some are worse than others. Please...do your research before spraying or powdering your vegetables for insects. A good rule of thumb is to type in the name of the product in a search mode and add the words "dangers of." You can do this with many things and you will be surprised. I use a powder sprayer with diatomateous earth (DE). DE is not a cure-all, but it really helps. Just like sick people, if plants don't get the proper nutrients, water, light, food, etc., their "immune system" starts to fail. When this happens, the bugs attack. Thank you to Eliot Coleman for this bit of advice. Garden tools are necessities. Large, good-quality tools like shovels, rakes, hoes are crucial, but small handtools are also needed for compact areas and getting down and dirty with soil and plants. My favorite large tool is a collinear hoe. Eliot Coleman introduced this item on his show years ago. It is able to go between plants without doing the damage a large hoe would. Eliot also recommends buying forged tools vs. pressed-metal tools. You will pay more for these items, but they will be around long after you buy 5 or 6 (or more) of the cheaper ones. Here is a list of some of my favorite seeds or things I like to plant: lettuces of all types, rutabega, cabbage of many types, Brussels sprouts, tomatoes of many kinds, various kinds of greens, regular and sugar pod peas, beans of many types and cowpeas, okra, potatoes both white and sweet, onions of many types, summer and winter squash, peppers of various types both hot and mild, two kinds of brocolli, two kinds of cucumbers....and the list could go on. You can select different items from planting in the spring/summer or fall/winter gardens. I have many wild critters that love to snack on my garden veggies. I've even had voles or moles grab a plant and pull it underground leaving only the top leaves showing. I have plenty of deer, raccoons, opossums, rabbits, etc that love to come dine. What do I do about it? Try fencing! I use T-posts (or rebar rods depending on the fencing) and 2" x 4" x 6 ft. high welded-wire fencing all around my 3 main gardens. Garden No. 4 is the pallet garden and I used rebar rods and plastic, 3 ft high fencing for that one. So far, no critters. Easy little garden made with two 4 x 8 ft. pallets or four 4 x 4 ft. pallets. I fenced this in with 3 ft. high plastic fencing and secured the corners with rebar rods. Some of the boards were removed to make planting sections. I filled it with soil from one of my main gardens and added compost, potash from the wood stove and lime. 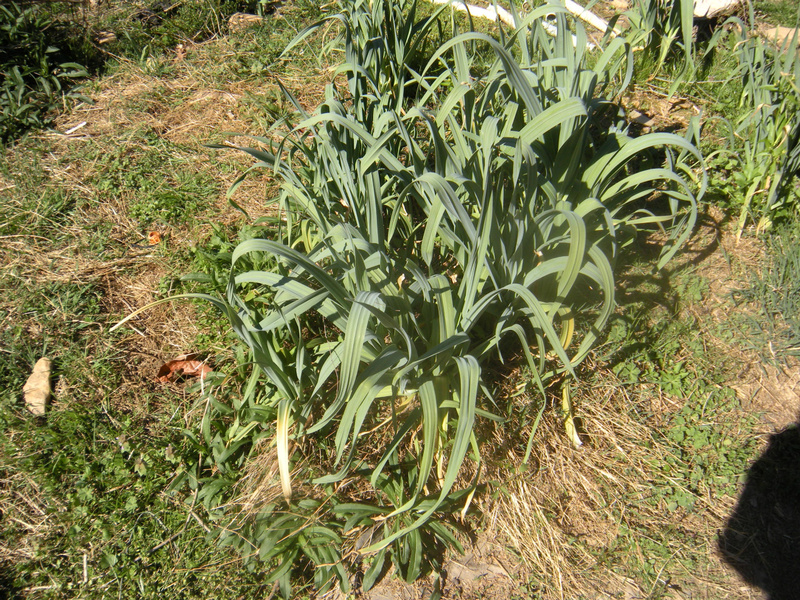 Garlic is an excellent addition to a garden. It loves rich soil. These are planted in an out-of-the-way area on the sides of one garden. I leave the bulbs in the ground and only dig up what I need. Because they are a bulb, they will keep multiplying. 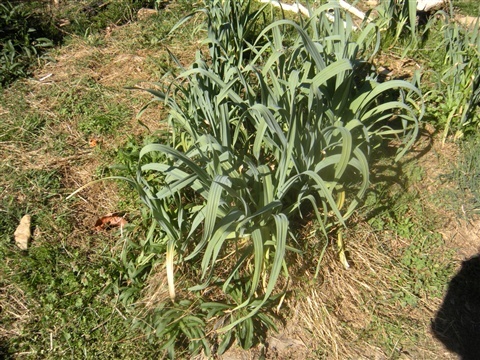 This photo is elephant garlic that has been in my garden for 23 years. 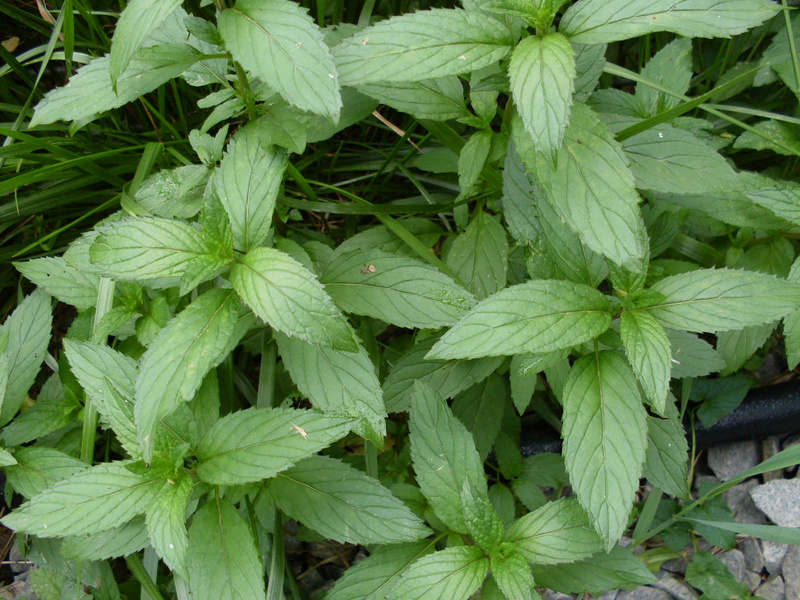 I have patches of this type all over the garden and in flower beds. 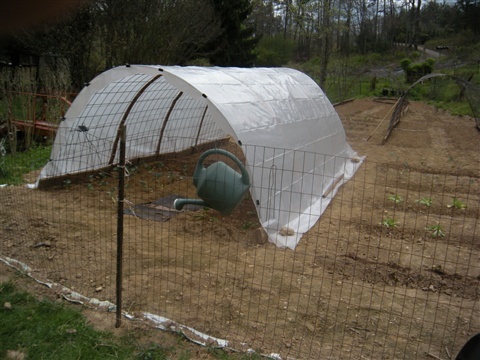 This is one of three hoop houses that I have in my garden. It can be used year-round. In the winter, I will add front and back plastic curtains. The hoop is 16 ft. long, 6 ft. high and 9 ft at the base. A walk path of 2 ft runs down the center, which was covered with old carpeting. Planting is done on each side. Because the three houses are not aligned, the air flows through and keeps everything cool. This one was still under construction. More to come! This is a lovely place to garden. The creek bubbles and gurgles while I plant and pull weeds. This is a lovely time to meditate on the Word of God and His Creation. 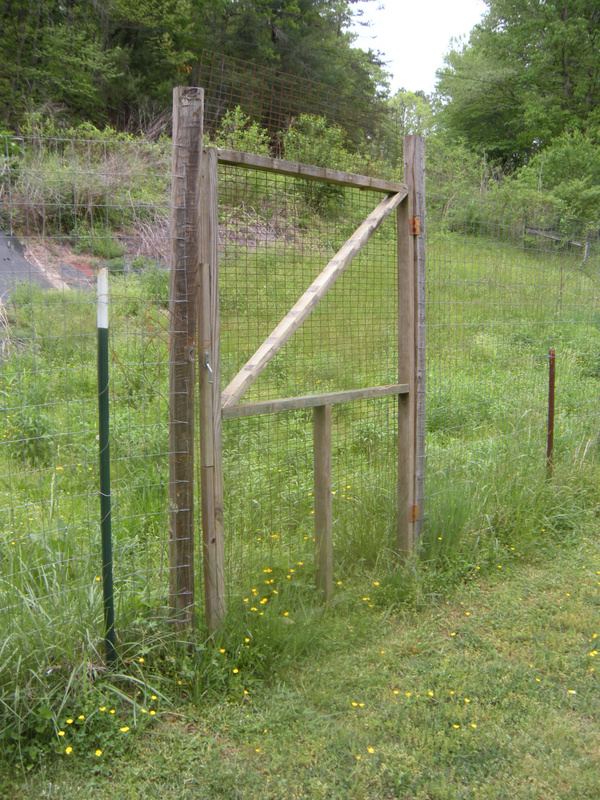 Very easy gate to build from 3" diameter PVC pipe, 90 degree Els and Ts. Then I painted it green. This gate can easily be taken down and re-installed. This gate takes more time. 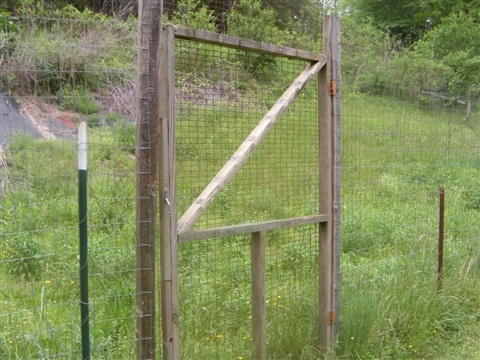 It is made out of wood, fencing over the gate frame, side posts are 4 x 4' landscape timbers, two hinges and one latch. As you can see, T-posts are holding up the fence.